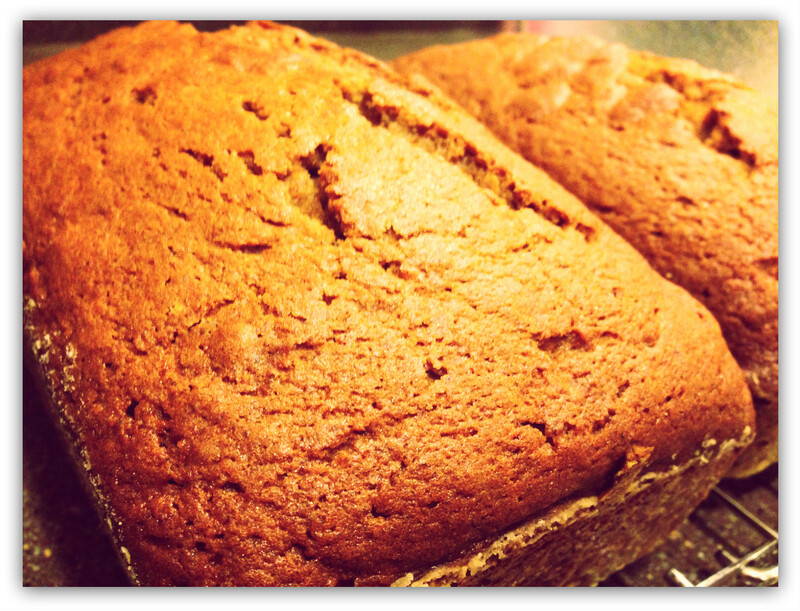 Pumpkin Bread: Classic, easy, and absolutely delicious. I love pumpkin bread, and apple spice bread, and cranberry walnut bread, and all the other breads of the holidays. 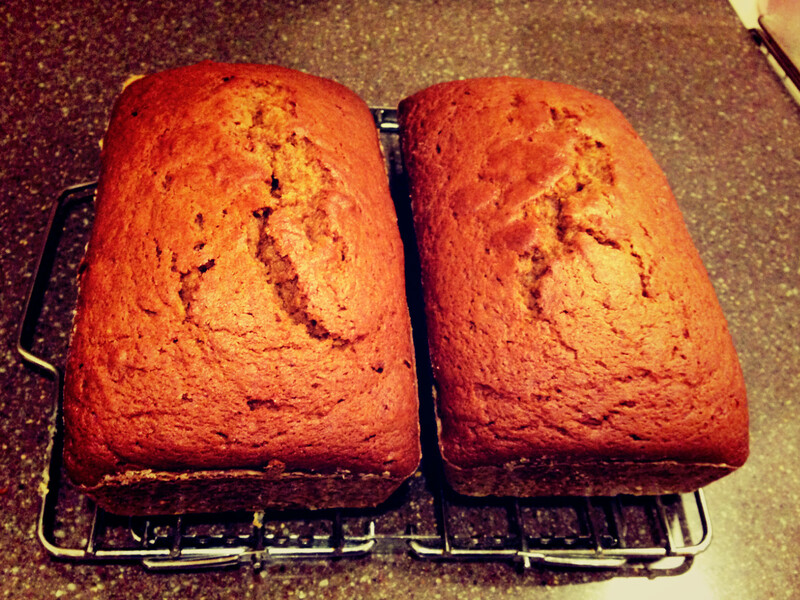 Last weekend, I made pumpkin bread, and it was wonderful. Moist, soft, and just the right combination of spices. The recipe I used made 2 loaves, which is great, because one is NEVER enough. And, since I was at my parents’, I got to relish in the delightfully spacious kitchen in which my baking obsession was born, and I had a direct line of sight to the TV (oh, how I’ve missed that…sigh, my life is so difficult). Covert Affairs, all the way. Tip: A little bird once told me (aka, I don’t remember who) to pour each of your ingredients in a different part of the bowl before mixing. That way, you can look at your bowl just before you mix it all together and be sure you didn’t forget anything. This recipe was so quick and easy and extremely delicious…just combined ingredients, mix, and bake. Both loaves were devoured before week’s end! (It could have been faster, but I try to savor!) 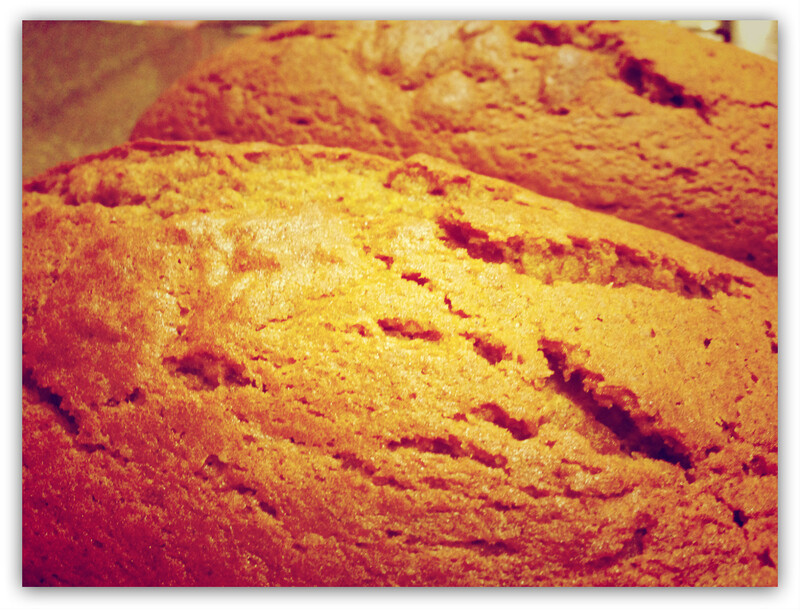 I absolutely love pumpkin bread. And since it is bread, not cake, or cookie, or, technically, a dessert of any sort, I can convince myself it is good for me, and eat it devour it, guilt-free. Enjoy! In a large bowl, combine pumpkin, eggs, oil, water, vanilla and sugar until well blended. In a medium bowl, whisk together the flour, baking soda, salt, and pumpkin pie spice until well combined. **Walnuts, of course, are optional. You could add all sorts of other extras instead, or just keep it simple (but no less delicious, of course. Some options are: dried cranberries, chopped pecans, or chocolate chips. Let your imagination run wild! Thanks so much! That’s awesome! I love your blog too (it’s a daily lunchtime read)! I will definitely pay it forward to other blogs I love! Thank you for sharing the love!